Formosa Plastics expands capacity at Mailiao complex. Formosa Plastics plans acrylates complex in China. 300,000 mt/year acrylic ester plant. Running and will be completed in second-halr year 2006. Formosa Petrochemical Corp. (FPC; Taipei) says its board has approved construction of a previously announced naphtha cracker at Mailiao, Taiwan. The unit will cost NT$25 billion ($724.6 billion) and will have capacity for 1.2 million m.t./year of ethylene, 600,000 m.t./year of propylene, and 170,000 m.t./year of butadiene *, says Wilfred Wang, executive v.p. Completion is scheduled for second-half of 2006. FPC says it has applied to the Environmental Protection Agency (EPA; Taipei) for approval of the third cracker. ABB Lummus Global has begun basic engineering. FPC has two ethylene plants at Mailiao, with a combined capacity of 1.7 million m.t./year. Downstream producers at the complex have requested that FPC build a third cracker to meet additional raw material requirements from planned downstream expansions, FPC says. Three members of the Formosa group jointly own 90% of FPC. They are Formosa Chemicals & Fibres Corp. (FCFC), Formosa Plastics, and Nan Ya Plastics. FPC employees hold the rest. Nan Ya is completing its third ethylene glycol (EG) plant and planning a fourth unit there; FCFC is planning a third styrene plant; and Formosa Plastics is planning to expand vinyl chloride monomer capacity, FPC says. FPC will fund the project mainly from cash flow, and the rest from bank loans, the company says. FPC forecasts a more than doubling of net profits in 2003, to NT$17.8 billion, on sales up 30%, to NT$220 billion. Separately, the parents of FPC plan a separate listing for the company on the Taipei Stock Exchange next November, Wang says. Taiwan's Formosa Petrochemical expects to complete its third cracker in Mai Liao by early next year, a company source said Monday. The cracker will have a nameplate ethylene capacity of 1.2 million mt/year and a propylene capacity of 600,000 mt/year. In related plant news, completion of Taiwan's Nan Ya Plastics's new 600,000 mt/year monoethylene glycol line in Mai Liao has been delayed to March next year at the earliest due to difficulties in securing and fitting of plant equipment and electronics. EDC Plant are owned by Formosa Plastics Corporation, America and managed by FPC TX. Formosa Plastics says it has brought a 550-million lbs/year high-density polyethylene (PE) unit and a 350-million lbs/year polypropylene (PP) unit at Point Comfort, TX onstream. The PP unit is the second train of a 700-million lbs/year plant; the first train came onstream last April. Formosa Plastics Corporation, U.S.A. together with its subsidiaries (Formosa), is a full-service manufacturer and supplier of plastic resins and petrochemicals. Our operations include chemical and petrochemical manufacturing, natural gas drilling, and polyvinyl chloride (PVC) downstream processing. Formosa's plastic resins and petrochemicals are manufactured at four chemical manufacturing subsidiaries: Formosa Plastics Corporation, Delaware (dispersion PVC); Formosa Plastics Corporation, Illinois (specialty and commodity PVC); Formosa Plastics Corporation, Louisiana (caustic soda, EDC, suspension PVC, and VCM); and Formosa Plastics Corporation, Texas (caustic soda, EDC, suspension PVC, VCM, ethylene, HDPE, LLDPE, and PP). Energy and raw materials for our chemical manufacturing operations are supplied by three additional subsidiaries acquired in 1988: Lavaca Pipe Line Company (natural gas transmission), Neumin Production Company (exploration and production of natural gas and oil), and Formosa Hydrocarbons Company, Inc. (gas processing). Formosa processes these raw materials into energy (electricity and steam) and intermediates (ethylene and propylene gas) used in the manufacture of our products, helping to ensure consistent quality and uninterrupted supply. Acquired in 1982, J-M Manufacturing Company, Inc. (J-M) produces PVC pipe for sewer, water main, and general construction applications. J-M has grown to be the world's largest manufacturer of PVC pipe with 1999 sales exceeding $500 million. J-M operates 14 plants throughout the U.S. with some of the most modern production facilities in North America. In 1994, Formosa formed the Formosa Transrail Corporation to operate and maintain its newly acquired rail fleet. Consisting primarily of new, large volume railcars, the fleet transports products to customers across North America and Mexico, allowing the company to expedite all rail shipments and helping to ensure on-time deliveries. In 1978, we began to invest in the United States, in order to secure a supply of petrochemical materials. We selected the United States as the location for our overseas investments because, in addition to rich natural resources and well-established legal, political, and economic systems, the country possessed an excellent infrastructure and a well-educated workforce. After years of effort, Formosa Plastics Corporation, U.S.A., Nan Ya Plastics Corporation USA, Formosa Plastics Corporation, America, and Nan Ya Plastics Corporation, America were established. In addition, J-M Manufacturing Company, Inc. and Neumin Production Company were acquired. Presently, we own several large petrochemical plants, secondary and tertiary processing plants, and natural gas wells. Polyvinyl chloride (PVC) and its related products were the original product groups in our U.S. operations. Currently, our annual production capacity for PVC resin has reached 971,000 MT. FPC is the largest U. S. producer of PVC pipe (840,000 MT/year), PVC rigid film (105,000 MT/year), and PVC flexible film (96,000 MT/year). Widening our scope of operations, we now have a polyester plant in South Carolina (860,000 MT/year) and an ethylene glycol plant in Texas (327,000 MT/year). Due to the quality and fair pricing of our products, the demand has been exceptionally high. To further vertically integrate our production, in 1990 we invested U.S.$1.9 billion to build the first olefins plant and 8 related petrochemical intermediate plants. In 1994, we successfully launched our expansion project. Followed by the completion of a second olefins plant in 2002, we now can produce 1,500,000 MT/year of ethylene, 860,000 MT/year of polyethylene, 630,000 MT/year of polypropylene, 1,008,000 MT/year of NaOH, and 1,200,000 MT/year of ethylene dichloride. Formosa Plastics Corporation, U.S.A. is a single-source supplier of PVC, PP, and PE with the capability of modifying production to meet varying market demands. In 1990, we set up the Inteplast Corporation, a state of the art facility in Texas, for production of BOPP, stretch film, XF film, PP corrugated sheet, Rigid PVC Sheet, foam board, and PE shopping bags. In 1932 Yung-ching Wang borrowed $200 from his father, a Taiwanese tea merchant, to buy a rice mill near the town of Jiayi. The mill was destroyed by Allied bombs in 1944, but Wang went on to make a fortune in timber and founded Formosa Plastics, a small polyvinyl chloride (PVC) plant, in 1954. He bought the technology from the Japanese, later joking that he didn't even know then what the "P" in PVC stood for. At first Wang had trouble finding buyers for his PVC resins. In 1958 he set up his own resin processor, Nan Ya Plastics, and later formed Formosa Chemicals & Fibre to make rayon backing for PVC leather (1965). For the next 15 years, the company grew into the Formosa Plastics Group (FPG), an exclusively Taiwanese enterprise. Between 1980 and 1988 Wang bought 14 US PVC manufacturers, including Imperial Chemical's vinyl chloride monomer plant (1981), Stauffer Chemical's PVC plant (1981), and Manville Corporation's PVC businesses (1983). He started building a Texas PVC plant in 1981 and cut construction costs up to 40% by importing equipment from Taiwan. When the PVC market became saturated in the mid-1980s, Wang diversified, building plants to make semiconductor chemicals. Wang bought several Texas-based oil and gas properties in 1988, including 218 producing wells, a gas-processing plant, and a pipeline firm. Faced with stricter pollution controls in Taiwan, Wang began building an ethylene plant in Point Comfort, Texas, in 1988. In 1992 Wang wanted to build an ethylene complex in mainland China, where there were no pollution controls. Taiwan balked at the proposal, suggesting that FPG build at home. Attempting to circumvent a Taiwanese law against direct investment in the mainland, Wang sought Chinese approval through subsidiary Formosa Plastics Corporation, U.S.A. In 1993 Chinese authorities rejected a plan that would require them to finance up to two-thirds of a $7 billion petrochemical complex. Formosa Plastics bought bankrupt US computer maker Everex Systems in 1993. Meanwhile, the group's focus again turned to mainland China when Nan Ya Plastics made plans in 1994 to build three plants along China's Long River. The 1995 death of Wang's mother (at age 108) set off a power struggle between family factions. The company won licenses in 1996 to build power plants, which would make FPG Taiwan's first private-sector power supplier and end a 50-year government utility monopoly. That year, in defiance of Taiwan's policy of limiting investment in China, FPG announced it would build a power plant there. Pressure from the Taiwanese government put the project on hold in 1997. FPG upped its investment in a new Taiwanese petrochemical complex in 1998. It formed ventures with Asahi Chemical to make spandex fiber and with France's Renault to make hybrid (gasoline/electric) cars. Also that year the group admitted to combining mercury-laden waste with cement and sneaking the toxic mixture to Cambodia disguised as 3,000 tons of cement block. FPG apologized after villagers living near the dump became ill.
Undaunted by a history of animosity between the two countries, Formosa Plastics and FPG's other flagship companies in 1999 invested a 60% stake in the production of power plants in the Chinese province of Fujian. The following year, the company announced plans to build a PVC plant in China as well. Chairman Wang Yung-ching of the Formosa Plastics Group (FPG) estimated the group will have to inject a combined NT$150 billion to have complete manufacturing operations at a special petrochemical zone in Ningbo, in mainland China's Zejiang Province(逝江省・寧波). Wang made the estimation after the Ministry of Economic Affairs (MOEA) gave the long-waited approval to Formosa Plastics Corp.'s (FPC) US$49 million investment plan in the mainland to build a polyvinyl chloride (PVC) factory. The US$49 million project of the Formosa Plastics Group (FPG), one of Taiwan's top plastics suppliers, has been withheld by government for around one year. FPG's plan is to build a polyvinyl chloride (PVC) factory in Ningbo, Zhejiang Province, China. The investment capital will be remitted to mainland China within three months. It will take two or three years to complete the construction of the factory, which is expected have a production capacity of 300,000 tons of PVC a year. Formosa Plastics says it has registered with China's customs authorities its previously announced 300,000-m.t./year polyvinyl chloride (PVC) plant at Ningbo for imports of raw materials and exports of finished product. Formosa Plastics Corp (FPC) has delayed the startup of its polyvinyl chloride (PVC) project in Ningbo, Zhejiang, China, to October 2004, according to a company source. Originally due onstream in the middle of 2004, the 300 000 tonne/year plant was rescheduled for mechanical completion in August 2004. FPC delays PVC start-up again. The start up of Formosa Plastic Corp's 300,000 tonnes/y PVC facilityat Ningbo, China, has been put back, for the second time, to the end of 2004. Start up was initially planned for mid-2004. Formosa Plastics Corporation, U.S.A. (Formosa) today announced that it has entered into an asset purchase agreement to acquire the Illiopolis, Illinois-based polyvinyl chloride (PVC) operations of Borden Chemicals and Plastics Operating Limited Partnership (BCP). The transaction is subject to approval in bankruptcy court. The US Bankruptcy Court for the District of Delaware Thursday approved the bid by Formosa Plastics Corporation, Delaware, to acquire the assets and operations of Borden Chemicals and Plastics' polyvinyl chloride plant in Illiopolis, Illinois, for approximately $35-mil, subject to adjustments for working capital and other items. Discussions continue concerning disposition of BCP's plant in Geismar, Louisiana, said Mark Schneider, president and chief executive officer, BCP Management, the general partner of BCP. BCP, which filed for Chapter 11 bankruptcy protection last spring, is required to place its Illiopolis plant on the auction block before it can be sold to Formosa. Other interested parties can submit bids through March 21. If other bids are received, the auction will be held on March 25. BCP idled the Illiopolis unit early last year, citing weak market demand. BCP recently completed the sale of its 600-million lbs/year PVC plant at Addis, LA to Shintech. The sale leaves BCP with its 275-million lbs/year plant at Geismar. The firms to be merged are Formosa Plastics; Formosa Chemicals & Fibre; Nan Ya Plastics; Formosa Petrochemical; and Formosa Taffeta. Formosa says it plans to apply to the Taiwanese government for approval to build a 230,000-m.t./year acrylic esters plant at Ningbo, China. The plant will cost $163 million, Formosa says. Vinyl chloride monomer (VCM) capacity at Formosa Plastic Corp's 720,000 tonne/y facilities in Mailiao, Taiwan, is to be increased by 80,000 tonne/y. Project completion is expected by the end of 2004. During 2003, the company also intends to raise ethylene dichloride capacity at Mailiao by 200,000 tonne/y to 800,000 tonne/y. Formosa Plastics is to invest NT$5 bn in capital expenditure projects in Mailiao, Taiwan, during 2003. Capacity for caustic soda is to be increased by 350,000 tonnes/y to 1.05 M tonnes by Jun 2004. Capacity for vinyl chloride monomer is to be improved by 200,000 tonnes/y to 1.52 M tonnes by Apr 2004. High-density polyethylene (HDPE) capacity is to be increased by 50,000 tonnes/y to 500,000 tonnes/y. Low-density polyethylene (LDPE) and ethylene-vinyl acetate copolymer capacity is to be increased by 40,000 tonnes/y to 240,000 tonnes/y. Capacity for linear low-density PE (LLDPE) will rise by 24,000 tonnes/y to 264,000 tonnes/y before the end of 2004. In Sep 2002 Formosa Plastics completed the expansion of acrylic esters at Mailiao by 18,000 tonnes/y to 198,000 tonnes/y. Formosa Petrochemical is to expand ethylene capacity at the same site from 1.45 M tonnes/y to 1.7 m tonnes. The Ministry of Economic Affair's Investment Commission recently approved two of Formosa Plastics Group's mainland China investment proposals. Formosa Plastics plans to invest US$49.57 million in an AE(Acrylic Ester) plant and Formosa Chemicals will invest US$17 million in a PS plant, both in Ningpo. Taiwan's Formosa Petrochemical has moved forward by a year the planned completion of its No 3 naphtha cracker at Mai Liao to early 2006, a company source said Wednesday. Formosa would begin construction by the end of 2003. Taiwan's Formosa Plastics Corp has planned a mid-November debottlenecking at its 180,000 mt/yr PP plant in Lin Yuan that would expand the capacity of the plant by 50,000 mt/yr to 230,000 mt/yr, a company source said Monday. The plant would be shut down for about 10 days to accomplish the expansion. Formosa Plastics Corp, USA reported Monday that in late September 2003 it signed the first licensing agreement for Newcon, Chisso Corp's reactor thermoplastic polyolefin (RTPO) alloy. Taiwan's Formosa Plastics Corp plans to start the second phase of a debottle-necking project at its 200,000 mt/yr acrylonitrile plant in Mai Liao in May, boosting total capacity at the plant to 240,000 mt/yr, a company source said Wednesday. Formosa uses most of its existing ACN output captively, and would export the additional ACN output to its new 120,000 mt/yr ABS plant in Ningbo, China, slated for start-up in early April, the source said. Taiwan's Formosa Chemical and Fibre plans to complete its styrene monomer unit in Mai Liao, currently under construction, in the second half of 2006, sources close to the company said Wednesday. FCFC's new No 3 unit would have a nameplate capacity of 600,000 mt/yr, and would boost the producer's total styrene capacity at its Mai Liao complex to 1.05-mil mt/yr. Taiwan's Formosa Plastics Corp has planned a new 450,000 mt/yr polypropylene plant in Ningbo, China, slated for completion by late 2006 or early 2007, a company source said Monday. China's Formosa Polypropylene (Ningbo) had delayed the start up of its new 450,000 mt/year polypropylene plant by four to six months, to the second quarter of 2007, a company source said Wednesday. The PP plant will be constructed at the company's new petrochemical complex in Ningbo, Zhejiang, eastern China. In addition to the PP plant, Formosa Plastics Corp operates a 300,000 mt/year polyvinyl chloride plant and a 300,000 mt/year acrylic ester plant. The storage tank would be able to hold roughly 44,000mt of ethylene, which would primarily support Formosa's recently completed 300,000 mt/yr PVC plant in Ningbo. The tank would also be able to provide ethylene for Formosa's planned 450,000 mt/yr polypropylene plant in Ningbo, scheduled to complete construction in late 2006 or early 2007. TAIPEI (AFX) - Formosa Plastics Corp said a group plant in Texas was hit by an explosion and fire but the incident should only have a limited impact on the company. 'Formosa Plastics Corp only owns 6 pct of the Texas plant, the impact on our operations and shareholders' interest should be very limited,' a company official said. Two other group members, Nan Ya Plastics Corp and Formosa Chemicals & Fibre Corp, own a combined 4 pct stake in Formosa Plastics Corp USA, the official said. The above-mentioned firms are all members of Formosa Plastics group. In an increasingly familiar scene along the Texas coast, black smoke and flames streamed from a Point Comfort industrial plant Thursday, following an explosion that injured at least eight workers. The blast at Formosa Plastics Corp. was the third to strike a Texas industrial facility this year and the second to hit one of the Taiwan-based company's U.S. facilities in 17 months. In addition to the Point Comfort explosion, the CSB also is investigating an April 2004 blast that killed four workers and injured six at a Formosa plant in Illiopolis, Ill. The company's other two U.S. facilities are located in Delaware City, Del., and Baton Rouge, La. In December 1998, a blast rocked the Point Comfort plant's ethylene dichloride unit, rattling windows as far as 35 miles away and injuring 26 workers. Last April, the Texas Commission on Environmental Quality fined the facility $150,000 for violations of air pollution laws that included releases of toxic chemicals such as vinyl chloride. Over the past decade, the U.S. Occupational Safety and Health Administration has inspected the Point Comfort plant a dozen times, five of them resulting in violations, OSHA online records show. In 1994, the company completed a $1.5 billion expansion, building its first olefins unit. In 1997, the plant underwent a second $1 billion expansion, in which it constructed a second olefins unit ・the part of the plant that erupted Thursday. 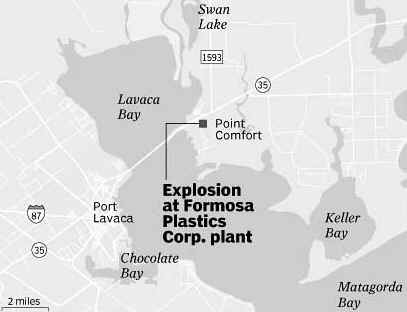 Thursday's explosions at Formosa Plastic Point Comfort plant happend when a contract employee using a forklift and pulling an air cart backed into a 6-inch line carrying liquid propylene, causing a break in a fitting or valve, plant officials said Friday in a memo. The pipeline was carrying the propylene at 165 pounds of pressure. The gas that was released from the pipeline vaporized into a cloud when it reached the atmosphere. The gas, which is heavier than air, traveled along the ground until it reached an ignition source and exploded, according to the memo. Although all employees are back on the job, "The plant is shut down," said Jack Wu, vice president of business development. "The damage is all in the Olefins 2 unit. The fire automatically shuts everything down." Wu said all employees are back at work getting ready to start up the plant, which he said, "technically, would take maybe two days." 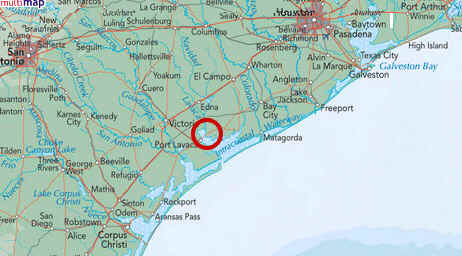 In a victory for a tiny, embattled environmental movement in Calhoun County, Texas, the Environmental Protection Agency (EPA) delayed granting the Taiwan-based Formosa Plastics Corporation the wastewater discharge permits it needs to begin operations at the company's newly expanded facilities. The EPA announced in February 1991 that it is requiring the preparation of an environmental impact statement before it will grant the permits. Formosa Plastics, Taiwan's largest chemical producer, has a history of environmental degradation and violations both in Taiwan and in its plants in the United States. Formosa Plastics Corporation, U.S.A. announced today that the last remaining minor fire resulting from an explosion on October 6 at its Point Comfort, Texas plant was extinguished early yesterday morning and that operations at the facility had resumed. 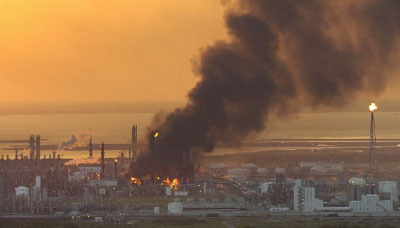 The company also said that damage from the explosion and resulting fire appears to have been limited to what is known as the "Purification Area" of the Olefins 2 production unit. The U.S. Chemical Safety and Hazard Investigation Board (CSB) is continuing its probe of the propylene fire and explosions that heavily damaged an olefins unit at the Formosa Plastics facility in Point Comfort, Texas, on October 6, injuring approximately 13 workers. Most injuries were minor, but two workers were admitted to the burn unit at a Galveston hospital, and one remains hospitalized there. After six days at the incident site, investigators yesterday returned to Washington, DC, where they planned to brief agency Board members and staff. Investigators have conducted approximately 24 witness interviews; examined the damaged area of the facility's Olefins 2 unit; and reviewed process diagrams, procedures, and other documentary evidence. Based on current evidence, investigators will not recommend a full root-cause investigation of the incident by the CSB. However, work to understand the circumstances of the incident will continue. CSB lead investigator Jim Lay, P.E., said, "Witness accounts indicate that a forklift truck towing an air supply trailer may have collided with a drain line near a ground-level control valve station carrying highly flammable liquid propylene. We intend to gather additional evidence before confirming this theory. Shortly after the trailer entered the vicinity of the valve station, witnesses saw a downward jet of escaping hydrocarbon, which formed a rapidly expanding vapor cloud. Within a few minutes, the vapor cloud found an ignition source, causing an explosion and fire." Major fires continued for a number of hours as additional piping was damaged and more flammable hydrocarbons were released. Mr. Lay said that access to the exact point of origin of the release was still restricted this week due to structural hazards, residual flammable materials, and ongoing emergency response and firefighting activities. "Portions of the olefins unit where the incident was centered show extensive damage from heat. The site shows relatively little blast damage, consistent with a series of unconfined, open-air explosions or deflagrations," Mr. Lay said. Immediate issues before the investigative team include characterizing the extent of secondary damage from the explosion and examining the effectiveness of the facility's vehicular control policies and the protection of vulnerable piping from vehicular collision. Mr. Lay said team members would be returning to the plant as early as next week to continue the probe. In addition to work at the Formosa site, investigators went into the Point Comfort and Port Lavaca communities to assess the impact of the incident. One school near the plant was temporarily evacuated on the day of the incident and two highways were closed for several hours. Investigators determined that approximately 15 members of the public sought medical evaluations at area hospitals; none was admitted to the hospital for treatment. The CSB is an independent federal agency charged with investigating industrial chemical incidents. The agency's board members are appointed by the president and confirmed by the Senate. CSB investigations look into all aspects of chemical incidents, including physical causes such as equipment failure, as well as inadequacies in safety management systems. The Board does not issue citations or fines but does make safety recommendations to plants, industry organizations, labor groups, and regulatory agencies such as OSHA and EPA. Please visit our website, www.csb.gov. For more information, contact Daniel Horowitz at (202) 261-7613 and (202) 441-6074. The U. S. Chemical Safety Board (CSB) issued its final report and recommendations today in the October 6, 2005, fire and explosions at the Formosa Plastics Corporation, USA, plant in Point Comfort, Texas. In addition, the CSB released a Safety Video which includes a computer animation depicting events leading to the accident. The Point Comfort complex, on the Texas Gulf Coast, is the largest Formosa facility in the U.S., employing 1,400 full-time workers and 400 contactors. The accident occurred in the plant's Olefins II Unit, which converts either natural gas liquids or naphtha into products such as propylene and ethylene. The accident began when a vehicle - a forklift towing a trailer loaded with cylinders of breathing air used in maintenance - snagged a valve, pulling it out of the system. This caused the release of a large volume of propylene which then ignited, creating a large fire. The initial explosion knocked several operators to the ground and burned two men, one seriously. Fourteen workers sustained minor injuries evacuating the complex. The CSB Case Study concludes that had the Olefins II unit been equipped with automated shutdown valves it may have been possible to stop the propylene flow, limiting the size of the fire. Operators were unable to reach manual valves to stop the release due to the presence of the growing vapor cloud. The investigation noted that the valve hit by the trailer was unguarded, and vulnerable to being hit by vehicles. The Case Study also noted that some steel supports were not fireproofed, and collapsed. This caused the failure of pipes designed to carry flammable hydrocarbons to the unit's flare system, where they could be safely burned in the atmosphere. Without this safety system in place, pressurized flammable gases continued to feed the fire, which burned for five days. In addition, the CSB found that flame resistant clothing was not required for all employee activities within the Olefins II unit where there were large quantities of flammable liquids and gases. CSB Board Member John Bresland said, "This began with a seemingly minor event, in which a trailer bumped into a drain valve. But the incident had disastrous consequences because the facility was not better prepared for a large chemical release. The fires and explosions at Formosa's Point Comfort plant provide compelling reasons to analyze vulnerabilities that could lead to a major chemical accident." CSB lead investigator Robert Hall said, "Our investigation focused on how this facility was designed to protect against major fire hazards. We found that the unit's design engineering firm used plans that had not been updated to incorporate the latest standards for fireproofing steel structures. Furthermore, workers were not wearing flame resistant clothing, which would have helped to protect them against the flash fire that occurred. We found that improved design practices and protective clothing could have reduced the impact of this accident." The Board issued several formal safety recommendations. Formosa Plastics Corp. USA, the Point Comfort plant, was urged to revise its policies and procedures for analyzing hazards, to include vehicle impact dangers, fireproofing of structural steel and mechanisms for controlling chemical releases such as remotely controlled isolation valves. The Board also recommended that Formosa provide fire resistant clothing to workers exposed to the dangers of flash fires. The Board recommended that Kellogg, Brown, and Root, the company that designed Formosa's facility, use the most current safety standards - including standards for fireproofing -- when designing new facilities. And the Center for Chemical Process Safety, a leading safety organization, was urged to strengthen its hazard evaluation guidelines to include vehicle impact hazards and isolation of equipment during emergencies. The CSB Safety Video, "Fire and Explosions at Formosa Plastics Corp.," may be viewed and downloaded on www.CSB.gov from the Video Room. Copies of this and all CSB videos are available on a DVD and may be obtained free of charge by submitting an online request form found on the website. Taiwan's Nan Ya Plastics Corp is aiming to start production of a new bisphenol-A (BPA) plant by October, a company source said Thursday. The company is currently in the midst of building the new 130,000 mt/yr plant at Mailiao, Yunlin. Nan Ya Plastics currently operates 3 bisphenol-A plants at the same site. These have a total production capacity of 290,000 mt/yr. FCFC has a total phenol capacity of 440,000 mt/yr in Mailiao, Yunlin. Formosa Plastics Group, one of the largest family firms of Taiwan, plans to build the factory of oil refining and ethene in Ningbo, located in Zhejiang province of China, according to sources. This plan includes establishing 10 million tons oil refinery, 1.2 million tons splitting ethene factory, 600,000 tons propylene factory and other chemical products. Taiwan's Formosa Chemical and Fibre Corp expects to bring its new polystyrene plant in China, Ningbo, on-stream in October, a company source said Tuesday. The 200,000 mt/year plant was previously slated to start up in August but due to incomplete construction works at the plant's facilities, that was postponed to Q4 of this year. Styrene monomer feedstock would be provided by FCFC's new No 3 SM plant in Mailiao. The new 600,000 mt/year unit has been running at 100% nameplate capacity since June 8. Taiwan's Formosa Chemical and Fibre Corp. is looking at the possibility of bringing its new 400,000 mt/year purified terephthalic acid plant in Loong-der on stream before June this year, a company source said Monday afternoon. FCFC currently operates two PTA plants in Mailiao, both with a production capacity of 500,000 mt/year. The company also has an existing 700,000 mt/year PTA plant in Loong-der. FCFC's new PTA capacity comes on the heels of recent start-ups and expansions, most notably China's BP Zhuhai 900,000 mt/year PTA plant in Zhuhai and South Korean Taekwang Industrial's newly expanded 950,000 mt/year PTA plant in Ulsan. Taiwan's Formosa Plastics is likely to start commercial operations at its long-delayed 450,000 mt/year Ningbo polypropylene plant early-April, sources said Thursday. Formosa finished construction work on the plant in June last year, but was unable to start commercial operations, pending approval from the Chinese government to use a discharging 揚荷 port for refrigerated propylene. Taiwan's Formosa Chemical and Fibre Corp is aiming to start up its 600,000 mt/year purified terephthalic acid plant in Ningbo, eastern China, by the end of April--having recently received approval from the central Chinese government to begin operations--a company source said Monday. Meanwhile, Formosa Plastics also recently received approval from the Chinese government to discharge refrigerated propylene to Ningbo. This would also allow the company to start commercial production at its 450,000 mt/year polypropylene plant there. In response to the pledge of president-elect Ma Ying-jeou (国民党候補の馬英九氏) allowing Maoliao麦寮　harbor of the Formosa Plastic Group (FPG) to undertake direct cross-Taiwan Strait shipment, Y.C. Wang王永慶, founder of FPG, said yesterday (April 7) that the group will forgo its mega ethylene project in Ningbo of mainland China. Wang made the remarks during a meeting between him, Ma, Morris Chang, chairman of Taiwan Semiconductor Manufacturing Co. (TSMC), and Terry Guo, chairman of Hon Hai 鴻海　group, dubbed as an occasion for Ma to seek advices from the three business tycoons on the development of Taiwan`s economy. Wang Jui-hua, vice president of FPG`s Group Administration Office and daughter of Y.C. Wang, noted that with opening up of direct cross-Strait shipment, FPG will be able to transport its petrochemical products from Mailiao to the mainland and therefore may not have to execute its mega ethylene project in Ningbo of China`s Zhejiang province. Wang fell short of confirming FPG`s decision to forego the project outright, saying that despite the narrowing of the gap between investment conditions of Mailiao and Ningbo following inauguration of direct cross-Strait shipment, the two projects aim at different markets, and as such FPG would still execute the Ningo project should the government flash a green light. Remarks of Wangs appear to underscore the difficulties confronting the FPG for the Ningbo project, mainly due to opposition of leading indigenous Chinese petrochemical makers, as a result of which China Petrochemical Corporation may take over the project. FPG`s mega ethylene project in the Beilun Petrochemical Zone of Ningbo City envisions annual crude-oil refining capacity of 10 million metric tons and ethylene capacity of 1.2 million metric tons, similar to its existing petrochemical complex in Mailiao offshore industrial zone. Wang died on early Wednesday morning in New York during a business tour to the United States from Oct. 11, the group said in a statement. Wang set up the Formosa Plastics Corporation in 1954, which is now a major conglomerate in Taiwan. Its business covers biotechnology, petrochemical processing and electronic components production. He was Taiwan's second-richest person with a net worth of US$6.8 billion (HK$53.04 billion). Taipei-born Wang opened a rice store as his first business in 1932 before founding Formosa Plastics Corp, Taiwan's biggest diversified industrial group, and then Nan Ya Plastics Corp. in 1958. Formosa Petrochemical Corp., Taiwan's only private refiner, plans to build a 50,000-metric-ton-a-year butadiene rubber plant in the eastern Chinese city of Ningbo, Chairman Wilfred Wang said Thursday. The company expects to complete construction of the Ningbo plant in 2013, Wang said at a shareholders' meeting, but didn't elaborate. He also said there is rising uncertainty over second-half global demand for petrochemical products, largely due to a potential slowdown in the Chinese economy amid a slew of tightening measures. Formosa plans to focus more on exports to Southeast Asian nations to avoid the impact of a possible slowdown in Chinese demand, he said.